Due to weather-related flight cancellations, Tuesday’s VIA speaker, John Prendergast, is not able to arrive in time for his 3:30 presentation. His talk has been rescheduled for 7:30 p.m. Wednesday in the upper level of the Jo Young Switzer Center on the North Manchester campus. When you have an opportunity to make a difference in the world, take it. For a real-life example of how passion and perseverance can be more effective tools than money or fame, meet John Prendergast. The presentation has been moved to 7:30 p.m. Wednesday, Feb. 18, in the upper level of the Jo Young Switzer Center on the North Manchester campus. The presentation is free and open to the public. He will discuss easily applied and effective means of promoting human rights locally, nationally and internationally. 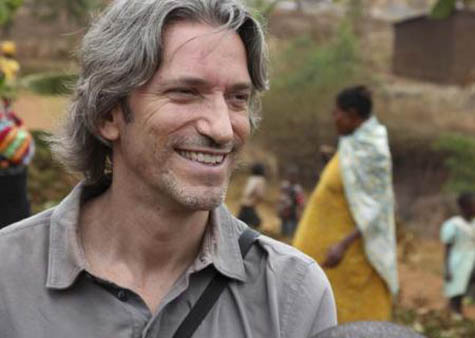 Prendergast created the Raise Hope for Congo campaign, supporting a more comprehensive peace process and highlighting the issue of conflict minerals, which are produced from illicit mining and fuel the cycle of violence. The campaign’s companion Conflict-Free Campus Initiative draws on the power of student leadership and activism, and encourages university officials and stakeholders to commit to measures that pressure electronics companies to responsibly invest in Congo's minerals sector. Prendergast worked with NBA star Tracy McGrady to create the Darfur Dream Team Sister Schools Program that raises funds to support Darfur refugee camps and create partnerships with schools in the United States. Prendergast worked for the Clinton White House, State Department, National Security Council, UNICEF, Human Rights Watch, the International Crisis Group and the U.S. Institute of Peace. He appeared in “The Good Lie,” starring Reese Witherspoon, on 60 Minutes and in documentaries, including Blood in the Mobile, Sand and Sorrow, Darfur Now, and War Child. He also worked with writers of Law and Order: Special Victims Unit to create African characters and their stories for two episodes. Prendergast has won multiple awards, including the United Nations Correspondents Association Global Citizen of the World Award and the U.S. Department of State Distinguished Service Award. Part of the Big Brother program for more than 25 years, he recently co-authored a memoir, Unlikely Brothers, with his first Little Brother. Other books include Not on Our Watch and The Enough Moment: Fighting to End Africa’s Worst Human Rights Crimes, which he co-authored with Don Cheadle. A book signing will follow the Feb. 17 presentation. This event is sponsored by the MU Peace Studies Institute with underwriting from the Ira W. and Mable Winger Moomaw Lectureship/Seminar Fund. Manchester University, with campuses in North Manchester and Fort Wayne, Ind., offers more than 60 areas of academic study to nearly 1,500 students in undergraduate programs, a Master of Athletic Training and a four-year professional Doctor of Pharmacy. Learn more about the private, northern Indiana school at www.manchester.edu. Prepared with assistance from Heather Elson, MU media relations student worker.